Accommodation for the staff on the hospital ships can never have been spacious, but they did have electric light, so it would have been one of the first hospitals to be so lit, and Nurse White was the first nurse to be disciplined for not switching off at lights out, but enjoying the new luxury of reading in bed. This must have been of little consolation to the Assistant Medical Officers living in cramped cabins under a leaky poop deck. 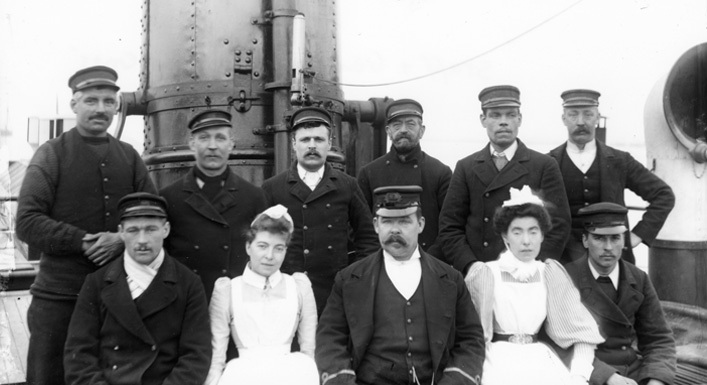 In 1901 Dr Ricketts voiced a complaint (and not for the first time), ‘From time to time I have pointed out the leaky condition of the poop deck on Atlas, under which these quarters lie. Some two years ago the quarters became uninhabitable for that reason, and as a temporary remedy the poop deck was painted on its upper surface and was closed for the use of patients and staff for the purposes of recreation. In 1895 he complained to the MAB about female staff accommodation, which two years earlier could only provide 130 beds for 139 persons. Thus a certain number of maids had slept two in a bed, but he does not say if they were in bed at the same time! Perhaps they acted Box and Cox, possible if some were on night duty. By 1895 the beds had increased to 136, but so had the staff to over 140. Thus more and more staff were coming ashore: a little colony was forming on land at Long Reach and the concept of total isolation in floating hulks was proving quite impractical. But attitudes were changing and by 1902, when Long Reach Hospital opened, and the ships closed, local opposition must have been muted. Dartford accepted the existence of the smallpox hospitals and anyway, they were good for trade.